Constructed to commemorate the Australian Bicentennial Celebrations in 1988, the walkway stretches for over 3km from Airlie Beach Lagoon to Abell Point Marina. Offering stunning views of the mainland and the marina, the walk is a short one but enjoyable. It is well lit with part of it being a well maintained timber boardwalk and can be enjoyed anytime of the day. 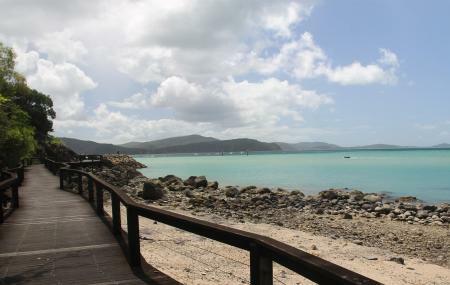 Ideal in the mornings or evenings when the sun isn’t too harsh, a walk here is the best way to enjoy views, sport birds and boats and explore Airlie Beach in a leisurely fashion. It is an easy walk and can be done with kids. Wear a hat and sunscreen, as this is not a covered walkway. How popular is Bicentennial Walkway? People normally club together Abell Point Marina and Mr. Bones while planning their visit to Bicentennial Walkway.